If you see Kowloon Walled City Park today, you wouldn't think that it has a very deep and troubling history dated back to the Qing Dynasty. It was first set-up as an outpost to manage the trade of salt and called Walled City, a city within a city. Although, a lot of guards were stationed there, nothing happened, until the First Opium War between British & Qing Dynasty. Even when Hong Kong was ceded to British Empire by the Treaty of Nanking (peace treaty that ended the First Opium War between British & Hong Kong), this city was free from all British influence. And to make sure that it will stay free, the emperor felt that it needed to be strengthen and so they improved it and built defense walls. With so many additional Hong Kong territories handed to Britain, the Walled City stays free of their hold. It became a settlement for soldiers and locals, until the British force suspected that it became the place to aid resistance. They attacked the Walled City only to find out that there no soldiers there, only residents. After the Qing Dynasty ended, the British finally claimed the city. Only to be taken away by Japan during the World War II. Japanese demolished part of the city and use the the land to extend the then Kai Tak Airport. After the World War II and Japan surrender, China reclaimed the city. Refugees from mainland China poured into the City, the only Chinese territory surrounded by British lands. British tried to drive them out of the city, but failed. They adapted a hands-off policy in most matters concerning the city. With no governance, the city became the haven for crimes, drugs, gambling and prostitution. It was just after a murder trial happened in the city that the Chinese government decided that it's time to enforce law. It was already too late, though, because the city was already controlled by triads. The government had a hard time reclaiming the city when the group gained a complete control of the city. They need a total of 3,500 policemen and help from public support, specially younger residents to weaken the triads. Over time, the city even after the crime rate lessen, had became intolerable so the government decided in demolishing it. They spend millions of dollars just to evict the residents and finally demolished the city in April 1994. The construction of the now Kowloon Walled City Park started a month after that. Now, when you go to the park, the only remnants you'll find are the Yamen and the Old South Gates. You really have to read the history before your visit so you can appreciate the park. Otherwise, you will just say, it's just a park and nothing else. Below are 8 landscapes worth checking at the Kowloon Walled City Park. Excavated during the demolition of the modern buildings was this remnants of the original Walled City, the Old South Gate. Dated back to the Qing Dynasty, it was built the same year as the Yamen. And along with Yamen, it's also a designated as declared monument with all related relics unearthed have been preserved and open for public viewing. The most important discovery was the two plaques with Chinese characters for "South Gate" and "Kowloon Walled City" which was mounted at the the original gate. The Eight Floral Walks is a web of paths which connects the distinct landscape features of the Park. Various types of flowers that bloom in different seasons are planted on both sides of the path to accentuate the scenery of the park in all seasons. Located to the west of Yamen, the Kwong Yam Square is a garden where flowers of the four seasons could be seen. 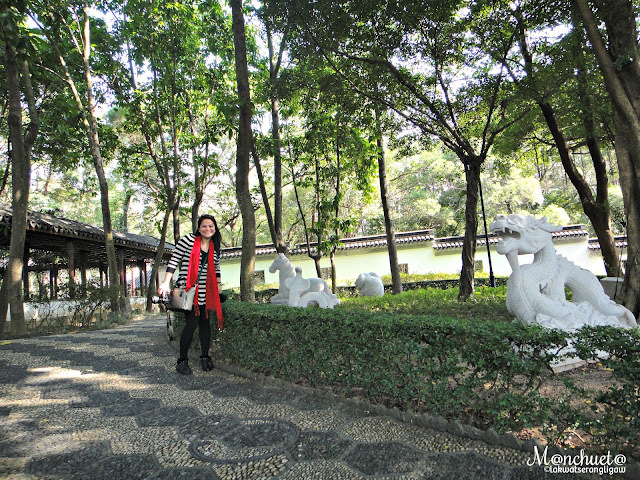 The garden features 12 vividly shaped Chinese zodiac sculptures. They are arranged according to the Heavenly Stems (Tiangan 天干) and Earthly Branches (Dizhi 地支) in Chinese astrology. The Guibi Rock was carved from Taihu Rock (太湖石). It is named Guibi because its veins are similar to those of ancient jade. Fui Sing Pavilion symbolises a constellation of literature and wisdom. 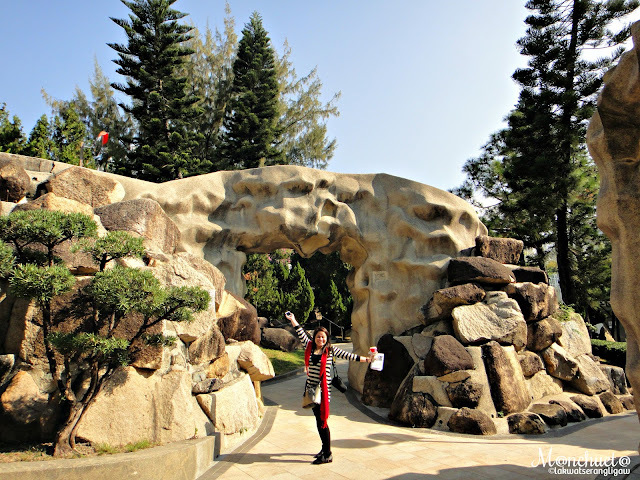 Guibi Rock also symbolises the hope of returning Hong Kong to China. There are four huge chessboards built on the ground with pebbles for visitors to enjoy a game of chess. The Mountain View Pavilion provides a fine distant view of the Lion Rock, which resembles a lion sitting with its head facing the Pavilion. This exhibition was officially opened for public use on 19 April 2009. It consists of one Outdoor Display Area and six Exhibition Rooms inside the Former Yamen. The Outdoor Display Area is located near the South Gate which shows a tablet and a model of the Kowloon Walled City. The front of the tablet has an introductory article inscribed whereas the back presents the cross-section of the pre-demolished Kowloon Walled City and the depiction of the daily lives of its residents. Behind the tablet stood a bronze miniature model of the Walled City which allowed the visitors touch and have a closer look at the City. Six exhibition rooms are located inside the Yamen which illustrate the living environment inside the Walled City through interactive imagery and sound. When you visit the park, make sure to walk all the way to the other side. Walk slowly and enjoy the view. Then after all that, make your way to the mall near the park for a shopping or dining. Like many other parks in Hong Kong, it's best visited when there's a cool weather if not, then at least bring an umbrella to protect you from the sun. Guided tours are arranged to provide further information about the history of Kowloon Walled City and the features of the Chinese Garden within the park. Tours are conducted for groups and park visitors for free. The duration of the tour is around 45 minutes with around 30 visitors per tour. Tours also give reference to the park and give detailed explanations of certain exhibits and notice boards. Please click here on how to get there from Lok Fu Station. really awesome all to me.